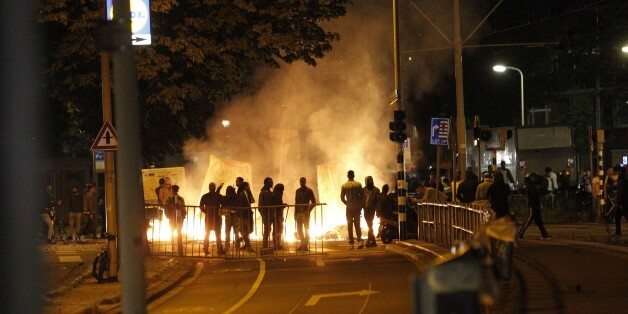 AMSTERDAM, July 2 (Reuters) - Dutch police fired warning shots and arrested 34 people during a third straight day of unrest on Thursday triggered by the death of a Caribbean man in police custody, and a temporary ban on public gatherings was imposed in a neighborhood hit by rioting. The death from apparent asphyxiation on Sunday of Mitch Henriquez, 42, from the Dutch Caribbean island of Aruba, has been likened to incidents in the United States that sparked protests over excessive police use of force. Disturbances erupted anew overnight on Thursday and police on horseback charged protesters who set fires, hurled bottles and rocks and smashed shop windows, according to a police statement. Later on Thursday, the mayor of The Hague imposed a rare temporary ban on public assembly in the neighborhood, where more than 60 protesters have been arrested since Monday, to try to stem the violence, the Dutch news agency ANP reported. Under the measure, no more that three people were permitted to gather in one place while "dangerous objects" and scooters were prohibited, other local media said. At one point during hours of rioting early on Thursday, police fired warning shots to ward a mob of youths who had cornered them, before riot officers arrived in jeeps, enabling their colleagues on foot to flee to safety. Police said calm was restored in the mainly immigrant neighborhood, known for tense relations with the predominantly white police department, by 4 a.m. (0200 GMT). Preliminary findings from an autopsy indicated that Henriquez died of asphyxiation after being held in a chokehold and pinned down by five white police officers. His death was almost certainly caused by rough police treatment, it said. Police initially said that Henriquez had become unwell while on his way to jail. But amateur video emerged on Monday showing him being taken away in an arrest van, apparently already unconscious, after the heavy-handed arrest. The five officers involved in Henriquez's arrest have been suspended pending results of an investigation. The Hague's police force has previously been criticized by Amnesty International and in a 2013 Dutch TV documentary for targeting foreigners and immigrants disproportionately and with greater use of force.